To preface, in case you couldn’t tell by the title, this post will be one with A LOT of transparency. I feel that it can be easier to start out each year by fluffing your ego with all the things you did right, intentional or by happenstance. But, to me, it is a whole lot harder to spend time in reflection on what didn’t work. To me, it is most rewarding to calculate all of the missteps, and the things that happened, which we’ll just refer to as “life",” which could have set you off course, that you overcame anyway. This past year has been a trying one, to say the least. It was a year of learning, dreaming, stretching and growing, but we accomplished almost every goal we set out for ourselves, despite A LOT of “life"“ happening along the way. It was a year of sacrifice, love, loss and humility, but boy, did we grow. I/we spent the year remodeling FOUR houses, two of which we lived in, two of which we did not, while also completing TWENTY real estate transactions for our buyers and sellers. If you’ve ever lived in a construction zone, you know what an ordeal this can prove to be, but you also know how rewarding the outcome can be, as well. It’s easy to become hyper critical of yourself when you start playing the “comparison game,” but I’ve learned what stops that mindset in its tracks, is appreciation for the process and for the obstacles you overcame. It looks like practicing kindness and self awareness for the uncomfortable space you find yourself in and learning to keep stretching, despite the discomfort, by living with intention. By the grace of God, we are still growing into our purpose. To brag on Cody for a moment, he got his real estate license in March of 2018. He put majority of our buyers under contract this past year so that I was free to focus on all the listings and remodels I was turning at once. I was blown away by the natural connections he made with our buyers and how detailed he was with everyone. He worked endlessly to make certain he found them exactly what they wanted, in the price point they wanted. I’m very cautious by nature, so I wanted to slowly immerse him into the role of Buyer’s Agent. Ya’ll he wasn’t having it. I wanted him to dip his toes in and he dove head first. He closed a transaction start to finish his first month being licensed. His natural talent, tenacity and skill with numbers has been amazing to get to witness. His energy gave me energy. All while, he did several big projects on our new home, things he’d never before done, but taught himself as he went. He has an incredible ability to work with his hands and to physically build anything and everything I threw at him. I’ll get more into that later, but the point is ya’ll, I stretched him BIG TIME and I’m so impressed and amazed by my man’s RESILIENCY. Oh and by the way, he was also planning a SECRET PROPOSAL during all this and the man did damn good. In my last post, I shared our beautiful home and our excitement for the next chapter of our life. I shared the home we were comfortable in. I shared the cozy rooms I had decorated and staged, the doors we’d painted, the patios built, the doorways we closed. I shared it in reflection of the chapter I was so proud to have contributed to and the beauty Cody and I, had created together. What I didn’t show you, was the two other homes I was remodeling at the same time, while we were purchasing a massive fixer upper. As a refresher, below was our home. She’s beautiful right? I fell in love with this project from start to finish. All the windows through out the home gave so much natural light, she was hard not to immediately fall head over heels for, even when she looked a little bit different. 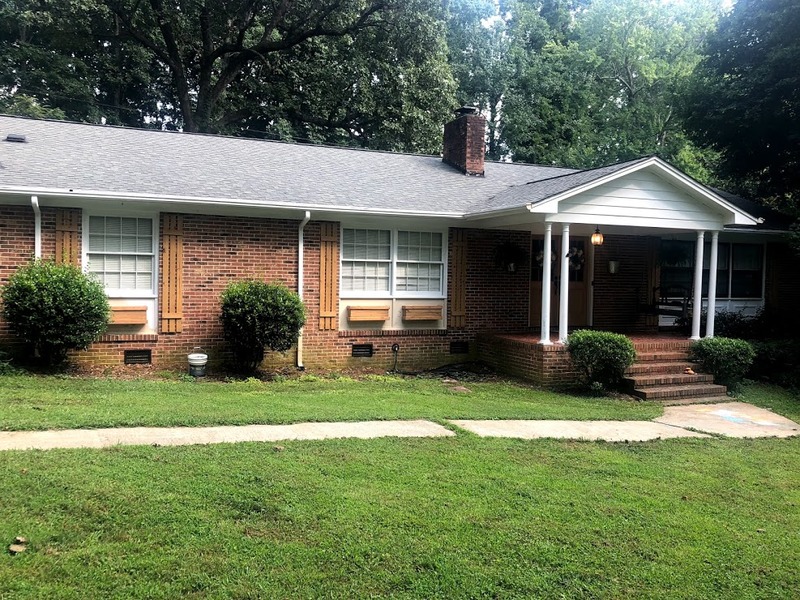 She got a new roof, new windows, new kitchen- white shaker cabinets and granite counter tops, new ceramic tile in the kitchen and bathroom, refinished hardwoods, new appliances and blinds. We closed in the doorway you can see above to finish the third bedroom out. We literally came in and started over and it was exhausting, but it was so much fun. Please ignore the couple photo of us in the background that I used to stage with. Lol. By the way, as each of these homes hit the market, I was constantly moving furniture and decor in and out of our current home to stage them with. Something to bring life and cozy feeling to the homes as they went to market. Everything you see in the photographs were taken off our own walls and out of rooms. A girl’s gotta do what a girl’s gotta do. The layout of this baby doll house was my personal favorite of all three sisters. I call them sisters because two of the homes, ours and Fixer Upper #1 were on the same street and Fixer Upper #2 was two streets over. They all share similar characteristics, having been built at the same time, but I swoon every time over the white picket railing and the fireplace on the front of the house. I love painted brick, the foundation and fireplace looked amazing with the “almond” color vinyl siding, which I actually initially hated and looked for every way to get rid of it, while staying within the budget. A huge lesson I learned, and am still learning, is how amazing it can be when you pair the right colors together, they become a beautiful medley for the overall project. Finding what to highlight, what to “tone down” and what to make the main focal points are my favorite part of remodeling. Like her sister, everything was updated. New windows, new roof, new kitchen-again white shaker cabinets and a unique granite, new bathroom vanity, new ceramic tile in the kitchen and bathroom and refinished hardwoods and paint throughout. So the thing they don’t show you on tv, is exactly HOW MANY decisions go into each day of the project and how much problem solving there is. You better know your industry, know your craft and know your budget and be damn good, if you’re in this line of work. Realistically, problem solving is about 90% of each project, depending on how lucky you get with the home you’re working on. See what I mean? These are just small examples. But, you do know your craft and you do know your market and you close $75,000 higher than if you would have sold the home, as is, and she sure is something to be proud of. I’ve had so many people ask me how I got into remodeling. Well first I’ll just say it was God’s plan, which I’m still trying to understand the end result of, but I couldn’t have dreamed this up if I tried. I was travelling with some girlfriends in New York when Cody sent me the picture of a “For Sale By Owner” sign and told me to call him to try to list it. The sign had been place in the yard of "Fixer Upper #1. In all honesty, I should have called, but I was on vacation and I just didn’t. He wasn’t licensed yet, so of course I had to. Then, the sign moved to the yard of Fixer Upper #2 and he sent me a picture again and told me to call. Again, I was busy at the time and didn’t. (Poor business practice I know.) The third time, it had moved back to Fixer Upper #1 and he sent it to me and I finally called. The seller didn’t answer, so I left a message. He ended up calling back, we met at the home. He told me his asking price and I was shocked by how low it was. I had sold four homes in the neighborhood at that point, so I knew what it would retail at. I asked him if he’d considered remodeling it and he hadn’t. I broke down the numbers for him and he was blown away how much more he could make if he’d allow me to remodel it for him. Just like that, I became his project manager. I brought in all the contractors, got all the estimates, scheduled and coordinated them all I performed all the design selections, roof color, paint color, cabinet color, tile color, ect. It doesn’t sound extensive, but ya’ll it is so much more than you’d ever believe. I have always been someone who goes above and beyond for everyone, especially clients and coworkers. A) Because I am a people pleasing person, which is both a blessing and a curse, but B) because I believe that everything you pour into other people and into helping them achieve success you will receive back 10 fold. I guess, that’s more than just a theory, because I began seeing this transform my life. Also as a part of God’s plan, this man came to be my/our financial backer so that we could begin our own fixer upper(s). So, now, onto my real, true, long lasting love. She’s still in progress, so I don’t have final professional photos for you, yet. I’m hoping she will be market ready this summer, depending on how the market does. But, I’m so unbearably proud of her and of our hard work that I have to show her off. This big girl was a BEAR. I thought I’d remodeled houses. I just showed you I remodeled houses. I even lived in one while we worked on one of the sisters. BUT YALL I HAD NO IDEA. The week we put in our offer on our new project, we put our current one on the market, which I shared extensively in the last blog post. A flurry of offers, even beyond what I could have anticipated, came in. We lived in our cars for 48 hours with 4 dogs. If you read the last blog post you know what I mean. We finally chose one and went under contract. It would be two weeks before we closed on our new home and three weeks before we closed on our old one. THAT MEANT I HAD A WEEK TO DO AS MUCH AS HUMANLY POSSIBLE. And then, everything that could happen, did. Life hit us at our knees and sent every plan we had into a tailspin. Beginning 5 days before closing on our new home, this happened. The white truck was Cody’s. I was in the middle of a four car collision. I was hit from behind, in the side and head on. Cody and I had traded cars for the day and I had our puppy Blu with me. Even though I blacked out, I still remember feeling the impact from behind, and another bump from the side, before coming to dangling upside down in my seat belt. The only thing I can remember seeing during the collisions was watching Blu do a somersault in the air as the truck flipped and the sounds of his scream (I’d never heard a dog scream before) when he landed. I could smell gasoline and one of my biggest fears is being trapped inside a burning vehicle. I unhooked myself and dropped to the ground. Crawling around on shattered glass, I tried to kick the doors open, they were jammed shut. I crawled across and started trying to kick the other door open, but it wouldn’t budge and the smell of gasoline had grown stronger. That was when I started to panic. My best friend and her family just happened to have been car lengths in front of me in the other lane and when they saw the truck upside down, her husband pulled over and ran to pull me and Blu out of the truck. In my entire lifetime, these were the scariest moments to date. When the police and fire department got there, I was obviously in shock, but I heard a lot of talking about how the cab of the truck should have crushed under the type of momentum and impact it had. Whether it’s true or not, I don’t believe you can look at those photos and not believe I had angels surrounding me that day. By the grace of God, Toyota and seat belts we both survived with only minimal bruising and neck pain. God protected us that day and I’ll never believe anything different. We began by renovating the kitchen and living room first, removing carpet, gutting the kitchen and adding hardwoods in the dining room and kitchen, then sanding and refinishing them, along with the living room. We went with a natural, light color for the flooring. I wanted something that was light and airy and just beginning to come in style, but also something that matched the rest of the hardwoods in the home that were still in excellent shape. We went with my favorite and predictable white shaker cabinets and gorgeous Carerra Marble counter tops. One of my first priorities was to get rid of the heavy, dark, hunter green doors on the front porch. I am a sucker for glass and for natural wood finishes so we found an inexpensive door that Cody made to fit and installed into French Doors. During the transaction, despite what a whirlwind our lives was, we sent three licensed professionals under our “soon to be” house to make certain the bones were good and we both even crawled the house with them. We did every thing right in our due diligence to make certain we bought a house with good bones. But regardless of that, somehow, everyone missed the termites. We had to pay more money to replace several sections of the double girder and band sill where it had been eaten by termites and no one caught it. The cabinet guy scratched our brand new hardwoods by not taking proper precautions and the flooring guy took it upon himself to start tearing the tile up in the bathrooms, something we were going to save to do much later. Thankfully they did, because the entire subfloor in both bathrooms was rotted out and also had to be replaced. We had to beg contractors to come back and finish the jobs they’d been paid to do, some still have not showed up to finish. This house alone was a full time job for me for months. 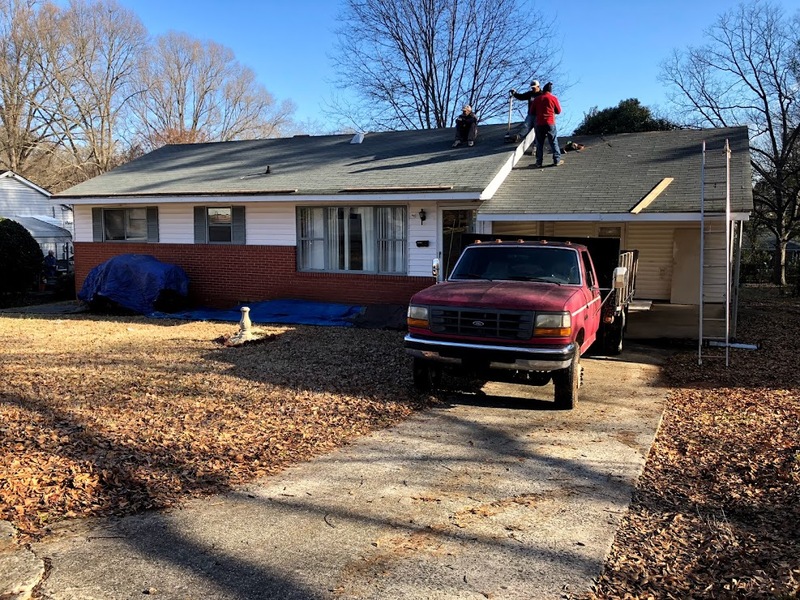 It was a lot more money than anticipated, which is standard with a lot of remodels, but eventually, after a lot of time, patience and sweat (from Cody) our home began to transform. Now to brag on my sweetheart more. Remember how I told you earlier that he’d taught himself how to do basically anything I asked him to build? He taught himself to build farmstyle shutters, flower boxes, exposed wood beams, a deck patio, the front porch railing, he installed the french doors, a window seat for the dining room, a mantle for the fireplace, a surround for the opening of the fireplace, shiplap for our kitchen and I could just keep going. Basically everything on the front of that house you see, he made it and installed it. If that is not gifted talent, I don’t know what it is. Reminder, WHILE TEACHING FULL TIME AND LEARNING REAL ESTATE FULL TIME. Ya’ll God gave me one amazing man and that is truly an understatement. Since there are still some small details to go, I’m not going to share the interior photos just yet. I’ll save that for the next blog post and depending on how ya’ll like this one, I may get Cody to share some how to’s on the next blog post. I may even get him to make me “how to videos” if anyone would like to see them! Please leave feedback if you’d be interested in knowing how he built some of these items. I feel like I say this every post, but there are some really exciting changes that Cody and I are currently in the middle of and I can’t wait to share them with you. But for now, I’ll leave with this, stretching and growing can be both painful and overwhelming. It’s never comfortable and it’s never ideal timing, but it is always a necessity to continue to move us forward toward our purpose and to strengthen our resiliency and our faith.